I grew up in upstate New York, and was first licensed in 1968. After graduating from college, I briefly lived in New Jersey, before moving to Denver, where I lived for 22 years. While in Denver, I was a software professional working for a large telecommunications company. I enjoyed contesting from Colorado and thoroughly enjoyed my association with other Colorado contesters. I moved to the southwestern corner of New Mexico in 2003, and built a house and antenna farm on an isolated hilltop. 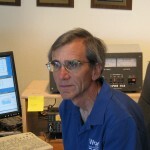 Using antennas that are modest by big-contest-station standards, I have had great contest success from New Mexico. I have been married to Kathy for 35 years. She has been very supportive of this crazy hobby and does an excellent job on the antenna ground crew. I am proud to represent USA-W5 and be a team mate with Kevin, N5DX. Not being a regular Dayton attendee, I am excited about being part of the contesting camaraderie of WRTC2014.